An irrevocable life insurance trust (ILIT) is a special trust which serves as both the owner and beneficiary of one or more life insurance policies. When it comes down to it, an ILIT is primarily a financial planning and estate planning tool that is used for to protect assets (specifically a large life insurance death benefit) from being subject to estate taxes. In the United States, you have the right to transfer your property and assets to a beneficiary or beneficiaries after your death. While you have that right, the federal government (and some states) hold the right to tax the value of that property and collect their piece. The estate tax is the tax that is collected against the value (the fair market value, to be precise) of your property upon its transfer, which means that while you won't pay the tax while you're alive, your estate might. If your estate is subject to estate taxes upon your passing, the amount that your beneficiaries ultimately receive may be greatly reduced. Most people prefer not to pay more in taxes than they absolutely need to, even after death, so for those families whose wealth may be subject to estate taxes, proper estate planning is crucial. While having a will and estate planning is crucial for anyone who wants to control where their property goes or who gains custody of their minor children (among other important wishes) after their passing, planning for possible estate taxes is essentially limited to families of a certain net worth because of the current estate tax exemption limits and exclusions. First up is the marital exclusion, which dictates that surviving spouses who are U.S. citizens are eligible to receive an unlimited marital deduction, meaning that no estate tax will be due on any property or assets (including proceeds from life insurance policies) when being transferred to a surviving spouse. There is also no limit on the amount of property that can be transferred to your spouse both during your lifetime and after. 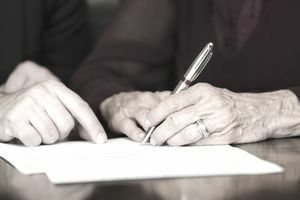 Due to the marital exclusion, estate taxes are not part of the estate planning equation until the surviving spouse passes away. Even upon the death of the surviving spouse, many families do not need to worry about paying estate taxes on transferred property because of the federal estate tax exemption. The estate tax exemption is the value of property, in terms of U.S. dollars, that a person can transfer to beneficiaries before the estate tax kicks in. It is essentially the amount that any one person can leave to others after death that will be free from estate tax, and that exclusion amount has been steadily readily rising for years, with the federal estate tax exemption at $5.6 million in 2018. If you and your spouse's joint net worth and gross estate value is projected to be significantly above the $5.45 million line, then it may be time to start talking estate tax reduction strategies, which may include an irrevocable life insurance trust (ILIT). An irrevocable life insurance trust is an estate planning tool that allows for the possible exclusion of life insurance proceeds from the estate tax by acting as both the owner and beneficiary of life insurance policies. If the legal owner of a large life insurance policy passes and that person's gross estate value is greater than the current estate tax exemption, then the death benefit from the policy would likely be subject to steep estate taxes. But with the ILIT serving as both owner and beneficiary, it essentially acts as an estate tax-shielding "middle man" between a life insurance death benefit and its intended beneficiaries. In order for the life insurance proceeds to benefit those intended, perhaps the deceased's children, the ILIT has beneficiaries for whom the trustee will invest and administer the proceeds from the policy. The life insurance benefit is generally meant to assist beneficiaries of a large estate to pay estate taxes without having to dip into the value of the estate itself, which may or may not be liquid. So while an ILIT can be a huge help in transferring large life insurance proceeds estate tax-free and providing the cash to pay any applicable estate taxes on the rest of the estate, it doesn't come without its downsides. An irrevocable life insurance trust (ILIT) is, by definition, irrevocable, meaning that once in place it cannot be reversed or amended. This is the key drawback to establishing an ILIT, as life and circumstances change. But it is this very characteristic of ILITs that excludes the life insurance proceeds from estate taxes. Since the trust is the owner of the insurance policies and cannot be revoked, the insured cannot be deemed as having incidents of ownership, which determines whether or not an asset can be subject to estate taxes. Other downsides of ILITs include their complexity and the costs associated not only with establishing the trust but also managing and maintaining it. Even so, for families whose estates are large enough to possibly be subject to estate taxes, an irrevocable life insurance trust is something worth contemplating. Would Your Family Benefit from an ILIT? Since the primary purpose of an ILIT is estate tax reduction, consider if and to what extent your estate will be exposed to state and federal estate taxes upon you and your spouse's deaths. Since the estate tax rules undergo frequent changes and your net worth itself may fluctuate greatly over time, you may need to periodically revisit a previous decision to forgo an ILIT. This is where an estate planning attorney and/or a financial planner can be of assistance. Who will be the trustee of the trust? Who will be the beneficiary of the life insurance proceeds? Will you be buying a new life insurance policy inside the trust or will you be transferring an existing policy? Once you make these decisions, they are not changeable, as compared to a revocable living trust. With an irrevocable living trust, you lose virtually all flexibility. On the other hand, as long as you live at least another three years after you transfer a life insurance policy to the ILIT (no minimum longevity is required for policies the trust itself purchases), all of your life insurance proceeds will pass outside of your estate, potentially saving your estate a sizable tax bill. Is an Irrevocable Life Insurance Trust (ILIT) Right for You?